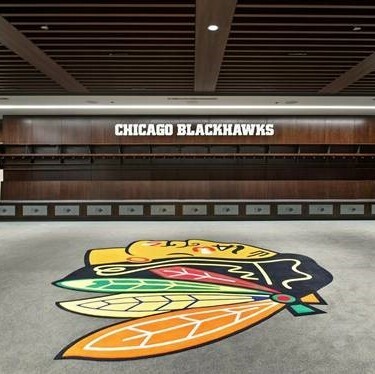 When the Chicago Blackhawks of the National Hockey League (NHL) decided to build a world-class training center in the heart of the city, one goal was to make it as “green” as possible. That wasn’t a problem for PPG PAINTS™. The company’s full complement of environmentally friendly low- and zero-VOC coatings was well-suited to protect and decorate every surface in the facility. As it turned out, the more difficult challenge may have been mixing a paint to match the exclusive “Blackhawk Red” color made famous by the team’s home jerseys. Located at the corner of Jackson and Wood streets not far from the Blackhawks’ home rink at the United Center, MB Ice Arena exists not just as a training center for one of hockey’s most popular and successful franchises, but also as a community center for children and young adults in the surrounding neighborhoods. The 125,000-square-foot building, which has earned LEED® certification at the Gold level, from the U.S. Green Building Council, contains two regulation-sized NHL rinks, 22 team and public locker rooms, medical and rehabilitation facilities, and a public fitness center and media center. The space also includes a restaurant, coffee shop, juice bar, rooftop deck and public meeting areas. PPG Paints won the painting contract for the $60 million project from ALL-TECH Decorating Company, Chicago’s largest commercial painting contractor, in a highly competitive bidding process. Shawn Faulkner, account development manager for PPG Paints, said selection wasn’t based strictly on price, but on a variety of factors. “We were chosen for the project because of our product quality, customer service and ability to provide the draw-down submittals the painting contractor and the general contractor required in a timely fashion,” he explained. More than a half-dozen PPG Paints products were applied throughout the arena. From the metal roofing decking finished with SPEEDHIDE® Super Tech Dry-Fog to the PITT-TECH® Plus semi-gloss paint protecting high-traffic stair treads and metal railings, PPG Paints cover a vast majority of the arena’s massive interior. The product most widely applied at MB Ice Arena was Speedhide Zero paint. A professional-grade zero-VOC interior vinyl acrylic designed for durability in commercial spaces and application in occupied spaces, the paint was mixed in as many as 10 colors for ALL-TECH to coat on different surfaces throughout the building. “Every color we mixed was custom-blended to match a color specified by the architect or interior designer,” Faulkner explained. One of the most difficult colors to match was the team’s distinct Blackhawk Red. Fortunately, as a nine-year industry veteran, Faulkner guided the process while also devising a paint- and time-saving solution for the contractor. ALLTECH also benefited from PPG Paints’ proximity to the work site. Every product and color used in the MB Ice Arena was blended and color-matched at the company’s retail store in nearby Stone Park, less than 15 miles from the job site. “There was a desire to get the job done quickly and it had to be done with other trades in the building because there were constraints associated with getting the new ice surfaces down,” Faulkner explained. Nearly a year after its grand opening, the facility continues to hold up well despite the wear and tear associated with hosting a professional hockey team; multiple community, youth and adult hockey leagues, and as a busy year-round gathering place for local schoolchildren. Our case study on how PPG partnered with the iconic property. Our products have been used in a variety of applications from state of the art office buildings to world renowned stadiums. PPG Paints has teamed up with the Pittsburgh Penguins to rename their historic hockey venue, PPG Paints Arena, and has become the team’s official paint supplier. The David L. Lawrence Convention Center opened in Pittsburgh in 2003.